What a splendid day May 19 was for all of the families who attended the first annual S.A.F.E. Kids Fishing Derby at Nottely Marina. The parking lot was filled. The sun was shining and the fish were biting. The excitement was evidenced by all who participated. This was a terrific way to celebrate the ending of the school year. Families enjoyed hot dog meals, on shore fishing games, the playground, and of course the serious fishing Derby. Joshua Owens caught a Catfish and here he is holding his Carp. A total of eight prizes were awarded including the top Four Largest Fish caught. Joshua Owens came in First Place by catching a 17 1/2″ 34.5 oz Carp. For his win, Joshua received a free half day fishing charter for one adult and two kids. This charter was provided by Jeremy Seabolt at Lake Nottely Fishing Charter. Karson Wester won the Tiniest Fish; Joshua Owens, won the First Catch of the Day, a Catfish; Cayden Cunningham caught the Ugliest Fish, and Ava Irwin caught the Prettiest Fish. Homes; Bank of the Ozarks; Anonymous Donor. Tick tock, set your clock so you don’t miss the S.A.F.E. Kid’s Fishing Derby! Saturday, May 19, 2018, is almost here, Towns and Union County families! Nottely Marina, located at 86 Doucette Circle in Blairsville, is the place to be. 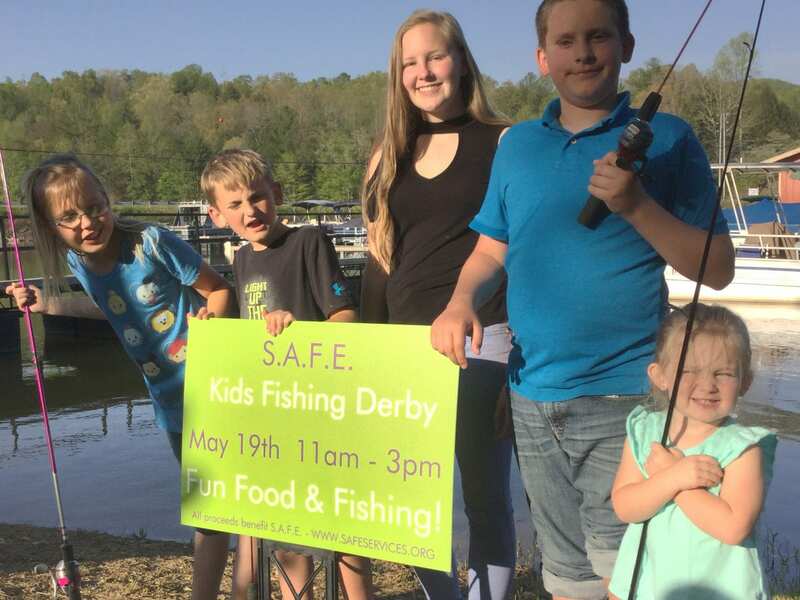 The Kid’s Fishing Derby starts at 11 a.m. and ends at 3 p.m. You don’t want to miss this end-of-the-school-year family event. Admission and parking are free. Parents must accompany their kids. Win a prize for catching one of the biggest fish. You might also win if you catch the ugliest fish, the smallest fish or the prettiest fish. The fish are biting. Carp, perch, stripers and bream have been sighted at the marina. There will be on-shore fishing activities to entertain younger kids. Buy a lunch plate, snacks and a beverage. Enter the raffles for a chance to win more lake fun. All proceeds benefit S.A.F.E. (Support in Abusive Family Emergencies). Meet representatives from the Georgia Deparment of Natural Resources and Lake Nottely Improvement Association. No fishing permit is required in order to participate. The S.A.F.E. Kid’s Fishing Derby is one of two events being sponsored by Nottely Marina. There will also be a S.A.F.E. Sail Into Sunset Cruise on Tuesday evening, June 19, 2018. Watch for details. S.A.F.E. is grateful to the following businesses that are making these events possible: Save A Lot, Blairsville; Paradise Bait and Tackle; Nottely Marina; Mike’s Seafood; Men on the Move; Lake Chatuge Marine; Ingle’s, Blairsville and Hiawassee; Hughes General Store; Food Land; and Cook’s Country Kitchen. Additional event sponsorships are welcome, and necessary! All proceeds benefit S.A.F.E. www.SAFEservices.org. Donations are tax deductible. To make an event donation, call or text 404-664-1328. The Mission of S.A.F.E. (Support in Abusive Family Emergencies) is to provide support, advocacy, and emergency shelter to victims of domestic abuse, child abuse and sexual abuse, regardless of gender, and to heighten community awareness of such abuse in Towns and Union counties. Next Article » Family fun in Blairsville this spring!